PR Week magazine reports today that Greenpeace has stepped up its campaign against Lego for jumping into bed with Shell. The pairing of Lego and Shell may at first seem like an unlikely commercial partnership: the former’s brand is a much-loved, global consumer favourite, while the latter’s is seen by many as toxic, the epitome of all that’s wrong with ‘big oil’. The two companies have a lot of joint-venture history, so what’s in it for each party? While it’s easy to think of several reasons why Shell might want to share a platform with fun, super-cool Lego, the only reason I can think of for Lego to cosy up to Shell is money – the chance to sell even more products through Shell’s huge global retail chain. Of course, business is about making money in most people’s minds. But in the 21st century when consumer sentiment can swing overnight, such decisions should only be made after the costs, both apparent and hidden, have been fully assessed. How much consideration went into reputation risk when Lego commercial people were pulling this latest deal together? 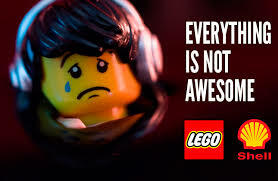 Not enough, judging by the statement Lego’s chief executive made in July in response to Greenpeace. The irony of that opening sentence will not have been missed by anyone with a basic interest in corporate issues management. The rest reads like a complete fudge. First, Lego vainly tries to distance itself from the issue Greenpeace wants to draw attention to. Then, the company tries to disguise its real motive by stating it wants to ‘bring bricks into the hands of more children’ – a proxy and highly disingenuous term for higher sales. That also seems like a wholly unsatisfactory message for at least two reasons: first, it dodges answering the question ‘what impacts?’; second, it fails the inverse test (you could hardly say “we’re not working very hard,” etc). Until now, and as an oil major, Shell has been the focus for campaign groups concerned about the environment. When you consider that plastics are derived from oil, it’s clear that in producing hundreds of billions of bricks since 1958, Lego has used rather a lot of what companies like Shell produce. Neither pays the true price their businesses cost the environment. Clearly the two have more in common than you’d imagine. Lego is only likely to come under increased scrutiny from environment campaign groups. It must learn fast how to respond more effectively. But more fundamentally, it needs to think much harder about what social responsibility really means.